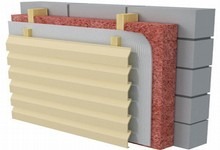 Wind-proof film for wall insulation against wind and water. The film is mounted from the bottom rises to the top. The upper band overlaps over 20cm on below. This is repeated up to the top. Omega-bearing profiles installation. Sections are mounted perpendicular to the mounting direction of the profiled sheet. Installation step under the project. All ports are circumvented perimeter.